Recently we were at a cocktail party when a group of us got into a discussion about a taboo cocktail party subject: politics. The debate was about one of those topics that just about every adult American, from the beginning of the Republic to now, has chatted about at some point — namely, who was the worst President in their lifetime. Our friend The Activist staked out a bold position; she says it was George W. Bush, hands down, and she later sent me a link to a New York Times piece that made the argument that he was even worse than Richard Nixon. It’s a somewhat familiar argument — sure, Nixon was a duplicitous crook, but he was a foreign policy wizard who has some “historic achievements” like opening relations with China, whereas in the writer’s view (and The Activist’s as well) Bush was a colossal disaster from beginning to end. I’m a bit skeptical of the argument, and not just because I think no one could be worse than a President who lied, covered up, broke the law, abused his office in countless ways, and ultimately resigned in disgrace. I also note that the article was written in 2007, while Bush was still in office, and I don’t think it’s possible for anyone to have any kind of perspective on a President until years, and more likely decades, after his term has ended and the long-term consequences of his actions become clear. 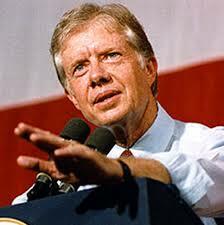 I also wonder: if we’re talking about awful Presidents, where does Jimmy Carter rank? I would never argue that he was worse than Richard Nixon, of course, but anyone who lived through Carter’s one term will recall the terrible and pervasive feeling that the country was lost, somehow, and there really wasn’t a captain at the helm. The economy was stagnant and wracked by ever-growing inflation and high interest rates and high unemployment, on the international front the Iranian hostage crisis made it seem like the United States was a powerless colossus, and Carter’s decision to retreat to Camp David to ruminate about the national soul rather than show leadership in the face of adversity left the country baffled. At the end of Carter’s presidency, the United States seemed pretty hopeless. Even at the worst moments of George W. Bush’s presidency, I never caught the same whiff of desperation that existed in the last year Jimmy Carter sat in the Oval Office. When Kish and I saw that Jimmy Carter had another book out, we wondered aloud whether he possibly could have anything new to say. Today I stumbled across this article, which notes that the former President has written 25 books — 25! — and urges him to please, please stop. The linked article treats the former President as a joke, which is sad. I think, rather, that President Carter comes across as a desperately needy and therefore somewhat pathetic figure. His ego seemingly cannot accept that, 30 years ago, he was voted out of office after one term and is generally regarded as a failed President. Since his defeat, President Carter has worked feverishly to try to stay in the public eye and somehow resurrect his reputation, even if it means churning out dozens of books that no one reads or even cares much about. Recently he even made the weird, and ultimately pitiful, claim that his work since he left office was somehow “superior” to that of other ex-Presidents. All of these activities are unfortunately reminiscent of Richard Nixon’s hopeless and doomed campaign to overcome the disgrace of Watergate by writing “serious” books about foreign affairs and foreign leaders. It would be better for Mr. Carter if he put down his pen, stopped injecting himself into world affairs, and simply accepted that history inevitably will judge him solely on the basis of his presidency. He can’t change the verdict of future historians. But by ceasing his hyperactive attempts to do so, President Carter could retain the remaining shreds of his dignity and self-respect, and that counts for something. What the Heck Are you Up to Mr. President ? A few weeks ago I was checking out the newly published books at the Upper Arlington library and I came across one with the title mentioned above written by Kevin Mattson. To my surprise someone had written a book on Jimmy Carter, America’s Malaise and His Speech That Should Have Changed the Country. I knew Bob had written a blog on the speech back during the summer and I also know that Bob tends to write his political blogs with a bit of a slant to the right so I thought I would read up on the issues surrounding the speech myself. What a truly fascinating book this was ! I highly recommend it to anyone that would like to revisit not only what happened during that time, but what could still happen today with our dependence on foreign oil. As the book mentions the 70’s was the “me decade”, people lived their lives to excess with “unrestrained consumerism” and “mindless self-indulgence” . President Carter had tried several times in speeches to warn American’s that there was going to be an energy crisis if we all didn’t try to cut back and conserve, but people just wouldn’t listen to him. So what happened in the early summer of 1979 is Iran stopped shipments of oil to the United States which in turn caused a shortage of gasoline, however most Americans still believed that the gas crisis was a BIG CON. The gasoline shortage caused many gas stations to close and those that were open would have long lines. Fear started to spread and there were incidents of shooting, property damage and personal injury. The president was planning on giving another speech on energy in early July of 1979, but his pollster was seeing a growing pessimism amongst the people. So Carter decided to ask for input from eight governors and after that meeting he sought counsel from an even wider array of prominent citizens, businessmen, labor leaders and religious leaders. He also went to the homes of several average American’s and they all said the same thing, there was tremendous political apathy in the country, a loss of faith in public institutions, a disrespect for government, churches and schools. So Carter felt the need to give the “Crisis of Confidence” speech. I’ve included a clip of the speech below. Immediately after the speech there was overwhelming support for what the President had to say and his approval ratings rose 11% over night. I think the thing that I found most interesting about the speech was that some of the issues and recommendations Carter touched on are still relevant today. As he said in his speech “we’ve got to stop crying and start sweating, stop talking and start walking, stop cursing and start praying. The strength we need will not come from the White House, but from every house in America.